Qatar’s ruler Sheikh Tamim bin Hamad al-Thani did not turn up at the one-day Arab League Summit in Saudi Arabia Sunday, an absence signaling continuity of the diplomatic crisis opposing Qatar to its neighbors led by Saudi Arabia. Sheikh Tamim returned from the US on Saturday after meeting with President Donald Trump at the White for the first time in the 10-month old Gulf crisis, which erupted after the visit of US President in Riyadh during his first maiden international tour last year. Saudi Arabia, United Arab Emirates (UAE), Bahrain and Egypt in June severed ties with the tiny Gulf gas-rich country over its alleged support for terrorism. Doha has strongly dismissed the charge. Qatar, which took part in the preparatory ministerial meeting in Egypt, the seat of the Pan-Arab organization, was extended an invitation to attend the summit. 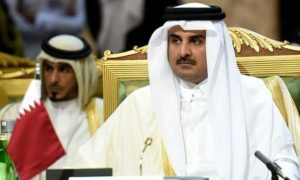 The Emirate’s state-run news agency, QNA, later said the Qatari delegation would be headed by Doha’s permanent representative to the Arab League, Saif bin Muqaddam al-Buainain. Late last week, Saudi top diplomat Adel al-Jubeir stressed that the gathering will not address the Gulf crisis adding the solution to the diplomatic spat would be found in the framework of the Gulf Cooperation Council (GCC), which includes Saudi Arabia, the UAE, Bahrain, Qatar, Oman, and Kuwait. Actually, the summit final declaration did not allude to the Gulf crisis. Posted by KanelkaTagba on Apr 16 2018. Filed under Gulf News, Headlines. You can follow any responses to this entry through the RSS 2.0. Both comments and pings are currently closed.